As millions of students across the country embark on their summer vacation, thousands of schools will be working hard to re-architect the textbooks, lesson plans and homework that will be needed to launch Common Core curriculum during the next school year. A recent article about Common Core implementation (Teachers Hit the Common Core Wall), cited three options school administrators, curriculum directors and superintendents can use to help teachers teach Common Core State Standards (CCSS). First, schools can maintain the status quo. Few, if any, schools and educational staff are likely to pursue this route because students will be taking new Common Core-based tests that are designed to better prepare them for college and careers. However, the biggest challenges toward redesigning school curriculum will be budget constraints, limited or fewer staff and insufficient time to complete a daunting task across many subjects and all grade levels. Second, schools can purchase new instructional materials. Caveat emptor: let the buyer beware. Being able to separate the wheat from the chaff to determine which materials are aligned to CCSS and which are not is a task that requires subject matter experts, instructional specialists and the engagement of teachers across all grade levels to ensure that the content, context and cognitive demands of the materials are compliant to Common Core standards. Just because a book may be labeled as “Common Core-aligned” doesn’t make it so. Another blog post touched upon this challenge: The Top 5 Things Content Developers Are Getting Wrong. The industry-leading service quickly identifies which materials are aligned with specific state standards and the percentage of alignment. Yet if one textbook is only 90% aligned, there is a fill-in-the-gap tool that identifies what material(s) can cover the remaining 10%. Thus a set of materials can be used to achieve 100% alignment because it is rare to find any one resource that is 100% aligned to the Common Core. Finally, there is the DIY (Do It Yourself) option. School administrators would need to assemble a task force of experts across subjects and grade levels to determine what types of existing and new materials may be used to ensure alignment to Common Core with some of the same challenges/constraints as the first option. They could also leverage recommendations from non-profit organizations or use Open Educational Resources. However, some states have centralized the instructional materials selection process while others are decentralized – each school district, area or region within the state must complete their own instructional materials selection and adoption process. Whichever option is chosen from the three above, we can be assured that the educational landscape is rapidly changing. 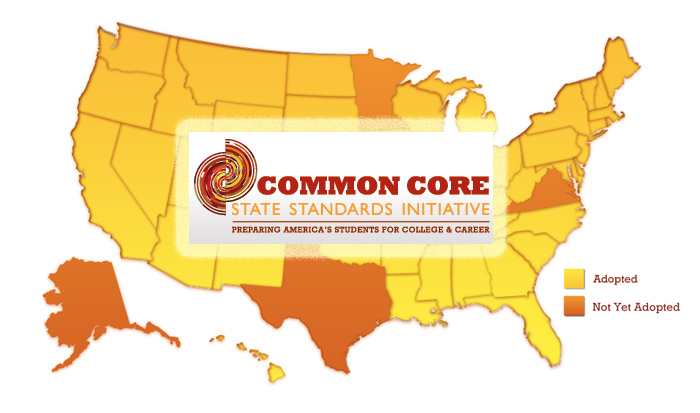 Stay tuned for more developments along the road to Common Core State Standards.